From April 11-13, 2016, I had the privilege of representing JustFaith Ministries at a Catholic conference on nonviolence in Rome, Italy. The conference was titled, “Nonviolence and Just Peace: Contributing to a Catholic understanding of and commitment to nonviolence.” This historic conference, co-sponsored by the Pontifical Council for Justice and Peace and Pax Christi International, brought together about 80 people from around the world— lay people, members of religious congregations, priests, and bishops—whose experiences of nonviolence ranged from scholarly and theological study to on-the-ground nonviolent resistance, to advocacy on a local, national, and international scale. Cardinal Peter Turkson, head of the Pontifical Council for Justice and Peace, gave the only address at the conference, reading a letter from Pope Francis, who wrote, “Your thought on revitalizing the tools of nonviolence, and of active nonviolence in particular, will be a needed and positive contribution.” In his own remarks, Turkson quoted Evangelii Gaudium, saying that to pursue a vision of peace, we must focus on both the dignity of the human person and the common good. The dreams of a child are peace. The dreams of a mother are peace. The rest of the conference consisted of a series of large- and small-group dialogues. In those sessions we shared our personal experiences of nonviolence, explored Jesus’ model of nonviolence, and considered how Catholic communities can more fully integrate practices of nonviolence. Threads connected the patches of our lives, the fabric of our tradition, and the cloth of our hopes, slowly forming a picture that we could not have imagined alone. All sessions were rich with stories of hope in situations of despair, of mending in in places of fracture, of love in places where hate would be easier. Bishop Paride Taban of South Sudan talked about Holy Trinity Peace Village, the manifestation of his dream, in which members of different tribes who used to call each other enemies now live, work, and solve problems as a community. The bishop’s peacemaking efforts extend far beyond the village, as he has, among other things, participated in negotiations between the South Sudanese government and rebels. Stories from the Philippines included both the nonviolent movement that led to Ferdinand Marcos stepping down from the presidency in 1986 and the countrywide peace education that has been going on there since shortly after that. Fr. Francisco de Roux, SJ, shared his experiences from the Magdalena Medio region of Colombia, where he and his teams talked to everyone – the military, the paramilitary, and the guerrillas – in an effort to create peace. In his personal statement he wrote, “in the Magdalena Medio, when we were surrounded by violent groups, we discovered that there is no safety in weapons. That the only true and sustainable protection comes through trusting people. And that to win trust we have to go through a long process of dialogue and mutual acceptance, and unpredicted individual and social changes, in the midst of uncertainties.” Now he is involved in the negotiations for a peace agreement that may finally bring the decades-long violence in Colombia to an end. Each story added a new patch to the blanket of peace. Many more, we need so many more before we can cover the whole world in peace. Mairead Maguire, 1976 Nobel Peace Prize winner from Northern Ireland, also emphasized that the promotion of peace requires us to engage with all people, regardless of how close or far we seem to be in ideology. She reiterated that we must do this always with love. When we recognize our common humanity, when we are willing to treat people with dignity and respect, it is then that we will be able to establish the relationships that can ultimately change a context of violence into one of peace. This idea may sound naïve, but Bishop Taban, Fr. de Roux, and peacemakers from places like Uganda, Croatia, and Iraq—people who are far from naïve about the violence in the world—made similar statements, speaking from their own contexts and experiences. It’s time for life, it’s time to make love, time to visit with friends. It’s time to play music and sing, sit down and eat, rise up and dance. In his Sermon on the Mount, Jesus called on followers to love enemies, to be peacemakers, to forgive and repent (Matthew 5-7). When asked what should be done to the woman caught in adultery, Jesus said the one without sin should throw the first stone (John 8: 1-11). Dear reminded us that at the Last Supper, Jesus spoke of giving his body for us. He did not ask us to sacrifice anyone else’s bodies. The night before he died, Jesus told Peter to put down his sword (Matthew 26:52). As he was dying on the cross, he prayed, “Forgive them, for they know not what they do” (Luke 23:34). If we wish to follow Jesus, we must practice nonviolence. re-integrated into our expanding cover of peace. a United States major said today. Why should all people embrace nonviolence? Quite simply, nonviolence is the most effective means to move toward peace. At the conference, Maria Stephan shared the results of a comprehensive study she and Erica Chenoweth did of the violent and nonviolent resistance movements in the 20th century, Why Civil Resistance Works. Whereas violent movements were 26 percent effective in achieving their stated short-term goals, nonviolent movements were more than twice as effective: 57 percent. The study also showed that nonviolent movements were at least ten times more likely than violent movements to result in the formation of democratic civil societies. 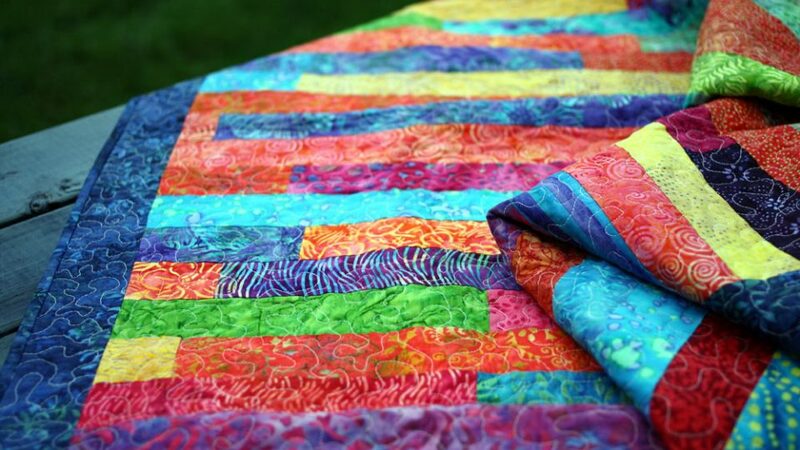 Bright pieces to add to our quilt. Nonviolent movements include engagement with all levels of society, from grassroots on up. A key element of peace-building is relationship-building. Developing relationships of trust and care, especially across lines of conflict, takes time. If we want peace, peace must be not only our goal, but our means. It must include dialogue and nonviolent resistance, as well as trauma healing, restorative justice practices, unarmed civilian protection, and other creative strategies. are you rejecting us as we reject you? so we may put new ones in their place. Cardinal Turkson presented our statement to Pope Francis. Conference attendees are now planning next steps in their individual and collective journeys toward peace and justice. The quilt of peace remains unfinished, but the sewing, the patching, the work continues. If you would like to bring Cory to your community to learn more about the conference and this important work, please contact her at [email protected].